Owners or authorized agents of lost promissory notes can use this free, printable affidavit to settle indebtedness with a borrower. 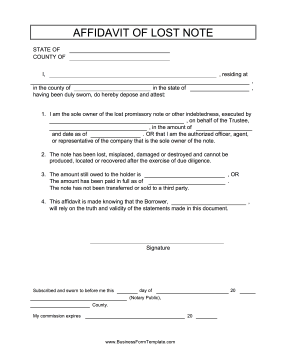 I am the sole owner of the lost promissory note or other indebtedness, executed by ____________________ , on behalf of the Trustee, ____________________ , in the amount of ____________________	and date as of ____________________, OR that I am the authorized officer, agent, or representative of the company that is the sole owner of the note. The note has been lost, misplaced, damaged or destroyed and cannot be produced, located or recovered after the exercise of due diligence. The amount still owed to the holder is ____________________ , OR The amount has been paid in full as of ____________________. The note has not been transferred or sold to a third party. This affidavit is made knowing that the Borrower, ____________________, will rely on the truth and validity of the statements made in this document.